Obliques are the trouble spot for most, if not everyone. They can be a pain to try and reduce the overall size. The function of the oblique muscle is for spine flexion, rotation, and lateral flexion. The origin of the oblique is on the Ilium and the 5th-12th Ribs. 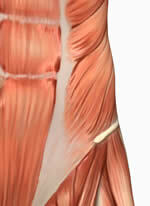 The oblique muscle inserts onto the rectus abdominis fascia and the Ilium. Ball to Ball Twists: This exercise is especially good for developing core strength.